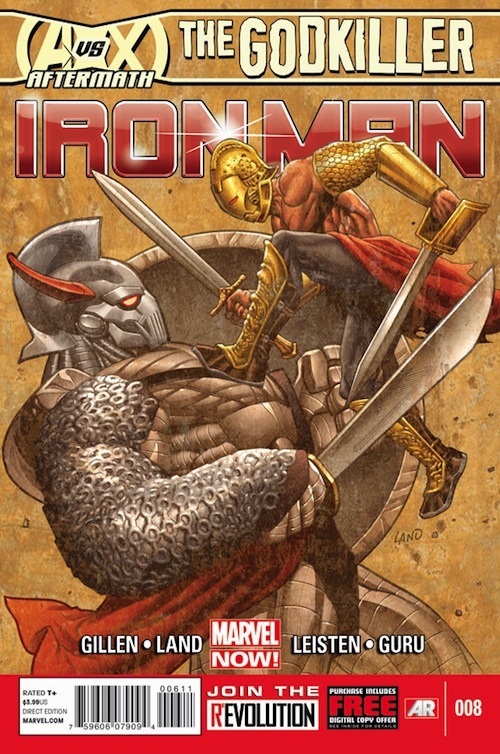 For reason I don’t totally understand, the Marvel NOW “Iron Man” title seems to get no love from comic fans – to the degree that I never see it mentioned except for a few cases where it was complained about and dismissed as a horrid book. Maybe it’s the upcoming film giving people this negative attitude towards it, I don’t know. What I do know is that this title is in no way a lead-up or hyped-up film-related project. 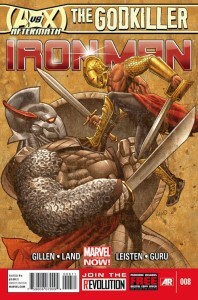 Throughout the title’s eight-issue run they have kept the Iron Man world as it’s been for some time. I am really into this book and, while it may not be the best on the shelf, it’s a satisfying read each month, which is something to be said nowadays with the ‘Big 2’. This issue is the conclusion to the recent ‘Godkiller’ arc, and is more or less a decent closer to this story. As a lot of Marvel NOW titles tend to be, this comic also ties in with the events and aftermath of the whole ‘Avengers Vs. X-Men’ debacle, but in an interesting way. We begin the arc with Tony Stark creating another new armor and, with the capabilities of the suit and its new P.E.P.P.E.R. AI system, he decides to head off and explore outer space. He realizes that with the power he has within his armor he can experience more in his life, things he wouldn’t have found otherwise. For a man and hero who, by this point, has seen quite a great deal, this is quite the statement. As he begins his travels, he happens upon a Pirate attack, and in true hero style busts his way into the battle, defeating the Pirates and being taken in as a victorious warrior by the alien race he helped – the Voldi, a seemingly peaceful race. The celebration of Stark’s help and win begins, and things are going great until it is revealed that Tony had a hand in the destruction of the Phoenix Force during the ending parts of ‘AvX’. The problem? The Voldi worship the Phoenix as one of their gods, and they are not happy in the slightest to learn of Stark’s actions. Stark is tossed into a cell to await his trial, when he is approached by Recorder 451, who looks to be a robotic lifeform of some kind. He tells Tony there is a legal loophole in the Voldi system which allows Tony to request a ‘Trial-by-Combat’, giving him a better chance of survival – if he can live through the fight. 451 promises Tony that he will get the Iron Man armor to him as soon as he can, Tony just needs to stay in the fight long enough for 451 to do so. The clever Voldi call upon their own loophole, and instead of a fight with “no enchanted combatants” who are to battle “as nature finds you”, they bring out the 30 foot tall cyborg Death’s Head. First off, it’s awesome to see Death’s Head, who is one of those side characters that I’ve always enjoyed. Tony and Death’s Head begin their battle, and Stark is obviously losing very quickly. When he brings up the fact that Death’s Head is in no way the type of fighter promised, even with the loophole, Death’s Head calmly tells him that since he isn’t using his ‘upgrades’ (such as rockets and the like) it is completely fine. The fact that the Voldi see most any creature, robotic, cybernetic, or whatever as actual living beings helps, as well. Death’s Head is smearing the arena with Stark, who is almost completely naked – his bare chest glowing a light blue – when we cut to 451, somewhere within the ‘Chamber of Evidence’. After moving something into a waiting spacecraft, he finds the armor and – with the addition of the new AI – he is able to talk with it, letting it know that Tony is in some major trouble. As the suit takes off towards the arena, we see 451 climb into the ship and escape. This, of course, makes one curious. Where is he going? What was his actual plan? Back at the arena, Death’s Head is about to smash Tony with a large boulder, no doubt to break his very exposed bones and flesh. As he raises the stone above his head, the P.E.P.P.E.R. driven suit blows its way into the fight, finally giving Tony the opportunity to suit up. This does not sit well with the Voldi, who scream that Tony has forfeited his case. In true Stark style, he basically ignores them all as he jets out of the Voldi’s hold and back out into space. As he attempts to fully escape, he finds that he has been chased down by a batch of Voldi battle drones, who waste no time in engaging him. Iron Man speeds off to a nearby location, where a weapon is waiting for him, and he locks it onto his wrist. Pointing the fully integrated weapon at the drones, he takes most of them out in one quick burst. We now see Veritina – the leader of the Voldi – in her Palace, watching Iron Man’s escape on a viewscreen. She is both excited and appalled by what she’s watching, commenting on his amazing ‘heroism’. Above her, through a roof of glass and metal, we can see the large bodies of the ‘Star Giants’, also known as the Celestials. Though the Voldi worship these gods, they also have been using the ‘Heart’ to keep themselves cloaked from the Star Giants’ sight. The ‘Heart’ was what 451 had loaded into his ship in the earlier scene, so it is no surprise when the Star Giants begin to destroy the Voldi. As we go back to Tony battling the drones, he is curious when they shut down on their own out of nowhere. Suddenly, appearing as if there were a giant screen in the fabric of space, 451’s face appears. He explains to Tony that he did, in fact, steal the ‘Heart’, and that the Star Giants have decided to destroy the Voldi because they see them as leeches who, had they not been hidden, might have been destroyed already some time ago. 451 explains how he set Tony up from the start to reach this goal, and Tony barks back about 451 letting an entire race be wiped from space just so he could get his hands on a ‘fancy cloaking device’. Finally, as 451’s projection dissolves, Tony has the suit’s new AI check for any survivors, of which there are none. Angry and blown away mentally by what has just transpired, he vows to find and stop 451, no matter what. This title has, for me, been enjoyable from the very first issue, and has yet to let up. There are a few points here and there that bother me, such as the too-conviently placed weapon awaiting Stark out in deep space, but overall the writing is solid and straightforward. No muss, no fuss, just stories with a purpose told very well. There never seems to be a moment wasted, and it never feels like things are moving too fast. Great pacing for such an action heavy title. And, this issue itself is probably the most action-packed yet which, due to the nature of the issue in the arc, feels perfect, and like the ending of some great space epic. Tony is written like the Tony Stark we’ve known for some time, not at all like the Robert Downey Jr. film version, which Marvel seems to like doing (just watch an episode of ‘Avengers: Earth’s Mightiest Heroes’ and you’ll be cringing like I was, most likely). He is the egotistical yet fragile character he has been for some time, and Kieron Gillen’s scripting holds true to that fact. As mentioned, this may not be the best book on the shelves, but the writing is well tuned and flows well. I know a lot of people seem to have major problems with Greg Land’s artwork, to the point of videos being posted showing his artwork up against the actual magazine photo, etc. that Land based his drawing on. Honestly, most of these are spot on, and some are even directly stolen from the photo in question. This doesn’t matter to me, as I’m not here to comment on his style of working, but his work as presented here. I like it, and at times even *really* lie it, but a lot of times it can feel very flat and emotionless. His Tony really only has about three expressions, and a lot of the character models look very similar to one another. I do like his work on this title, but that is the main thing that bothers me. The adventures in the suit, however, look great. This seems to be Land’s strong point – space battles and any sort of action scenes. This is where his work shines and makes it worth pulling yourself through the more Tony-oriented dramactics. So, a very uneven title in terms of art, but enjoyable, nonetheless. Overall, I was waiting for a new Iron Man title for some time, and this is just about what I needed. It’s not 100% solid or even consistent in the production (especially and mostly in the artwork), but it has kept me reading for 8 issues so far, and I am more than excited for #9. Don’t overlook this title if you’re even a remotely interested fan. It’s still Iron Man under the hood, he just has a bit of a damaged exterior.